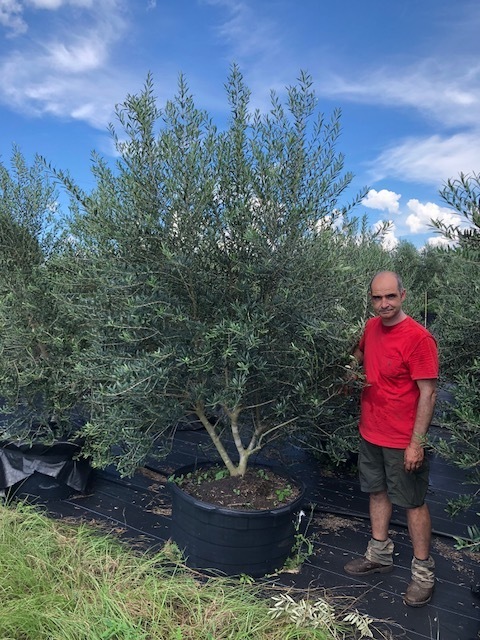 A Natural Farm grows Olive trees in large numbers from small 6 inch pot sizes up to large specimens in 150 gallon pots. THIS VARIETY IS A RESILIENT TREE, RESISTANT TO PESTS & NEARLY IMMUNE TO ALL DISEASE. VERY COLD HARDY FROM ATLANTA TO MIAMI. THIS SPANISH OLIVE HAS INTENSE, EXCELLENT FLAVOR. BRINE CURED FOR TABLE EATING OR PRESSED FOR MAKING EXCELLENT HOMEMADE OLIVE OIL. TREES ARE SELF-FERTILE AND HIGHLY PRODUCTIVE. OLIVE TREES FRUIT RELIABLY IN THE SOUTHEAST. GREY-GREEN EVERGREEN FOLIAGE OF THE TREE OFFERS ANY LANDSCAPE (INDOORS OR OUTDOORS) A DISTINCT BEAUTY. THE TREE IS TYPICALLY WEEPING, ALTHOUGH WE HAVE GROWN OURS TO BE STRAIGHT. 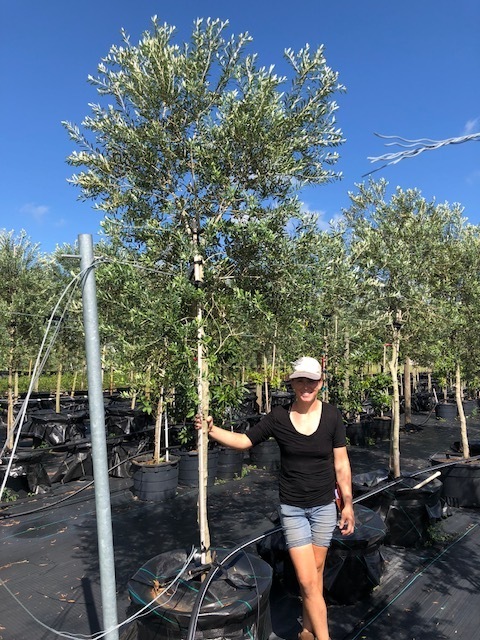 WE OFFER THREE SIZES OF OLIVE TREES AS WELL AS TREES PRUNED IN ESPALIER FASHION. USDA Hardiness Zones:8-11 (in the ground), ground planting into zone 7 is possible with microclimates and northern wind protection. Can be grown in containers in all zones, simply move potted plants indoors during winter months for protection and move outdoors during summer months to encourage greater fruit production. Chill Hours:250 hours to fruit properly; olives are commercially grown for fruit harvest as far North as Atlanta. We have observed Central Florida being the most southern zone for successful fruit harvest during cooler winters. Mild winters have been less successful in Central Florida for fruiting. Years to Bear Fruit/Edible Qualities:From our 5” pot size, expect fruit in 3-4 years. Our 7 gallon & 15 gallon trees are already producing fruit. Even smaller trees from cuttings will produce up to 20 lbs of fruit. Cold Tolerance:Cold hardy to 14 degrees, thrives in hot summers but Olive trees tolerate temperate regions without bearing fruit. Flowers & fruits will be damaged at 32 degrees. Olive trees are one of the hardiest adaptable plants to add to our edible & ornamental landscape designs. Originating in a Mediterranean climate, the olive plant is assimilated to hot & dry summers with wet winters. They don’t complain when there is plenty of summer rains though, thriving in various climates in zones 7-9. With up to 20lbs of fruit per tree - even in these conditions - we claim the Olive to be an incredibly resilient crop! Arbequina Olives are highly aromatic, small, dark brown and very flavorful. While used as a table olive, the fruit’s high oil content make them ideal for oil production. Pickling in a brine is best practice with an abundant harvest of home grown olives! Olives for Health & Prosperity! Olives and their oil contain bioactive compounds that contain high concentrations of antioxidants and exude antihypertensive, antiatherogenic, anti-inflammatory, hypocholesterolemic and hypoglycemic properties. Leaves of the Olive tree are also collected, dried and cut for their medicinal qualities. Brewing a tea with the leaves has similar benefits to Olive Oil. 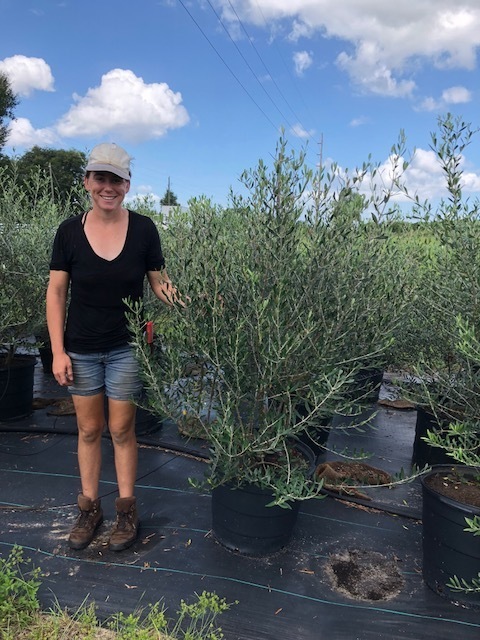 Grow in pots to bring a unique aesthetic to your home or office.Olive trees offer plenty of ornamental value as a container plant with their grey-green foliage.